It’s important to me that I have meaningful incentives built into my classroom routines. I wanted to use something more substantial than a box of trinkets to motivate my students. 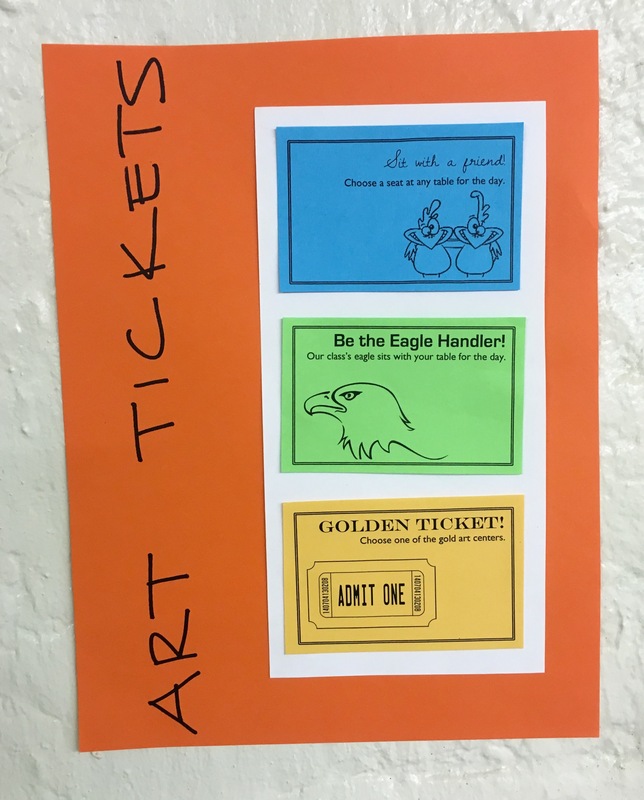 I came up with three different Art Tickets that students can choose from. I love that the tickets are for things that really matter to the kids, but are also completely or almost free for me to provide. The Sit By a Friend Ticket is a big hit because I have a seating chart that students have to follow every day, except for during centers. When a kid complains about not being able to sit where they want, I remind them that they can earn a ticket to choose their seat for a day. Our mascot is the eagle, so I bought a stuffed eagle that kids can have sit with them at their table for the day. I also brought in an octopus puppet that my dad gave me for Christmas. The kids love to us their Eagle Handler Ticket and have one of them sit at their table for the day. Some of my 4th graders even made necklaces for the eagle! The students work throughout the week to earn time for centers every Friday. On Fridays, I put out a Golden Ticket center. This is by far the most popular ticket! The play-doh and modeling clay were donated to my classroom (I think I’ve had the modeling clay for about 7 years now!) I fill the watercolor tub with paint trays that were used for a project, but still have all the colors in them. At the beginning of the quarter, I have my students work in teams to do a scavenger hunt for important places in the art classroom. The winning table all get to choose an art ticket. That day I send home a wish list of supplies they can donate. I make sure to have items on the list that don’t cost any money, like old newspapers or magazines.When a student brings in supplies, they get to choose an art ticket. For some classes, I award art tickets when a student or a few students are being a leader by following directions. I try not to lean on this strategy too much with my classroom management because it can cause other students to feel like I haven’t noticed how hard they are working. But every now and then, it’s nice to recognize outstanding behavior. I love using this ticket system because it gets my students involved and excited about the art room and it is incredibly simple for me to maintain. Classes that bring their binders are responsible for keeping up with their tickets. I keep a baggie in the class drawer for tickets if a class is coming from PE or lunch, but they know they are responsible for writing their name on it and putting it up. Elementary students learn about and connect with the artists their tables are named after. I only have my students for 28 class periods, which makes me want to fit art history into every facet of our classroom routines. 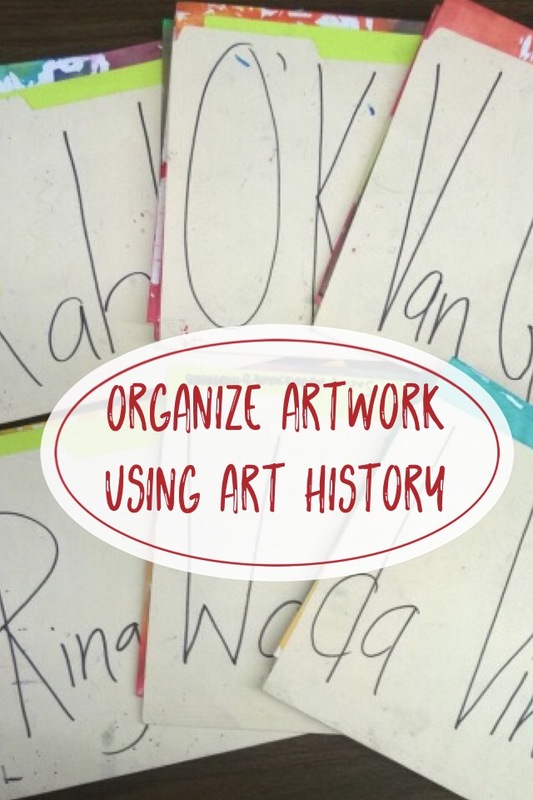 I discovered a great way to expose my students to important art history figures while keeping their artwork organized and easy to pass out. The supply box at each table has their artist’s name taped on it, along with a portrait and example of the artist’s work. The names change each year, so that over a student’s experience at our school they will become familiar with 24 different artists. I choose a diverse group of artists from different time periods and styles. On Centers Days, we spend 5-10 minutes learning about one of the artists that their tables are named after. We discuss the artist as a class first, then each table discusses their answer to a question about specific works of art. I created a Coloring Page Center so that my students would have something tangible to help them remember each artist. I publish an art newsletter that keeps our faculty and staff informed about what is going on in the Art Room. I post it in the bathrooms and leave a stack in our waiting area for parents to read. Each month, I include a section about one of our table artists. I created folders for each class that have their artist’s name written on both sides. This is how they turn in their artwork at the end of each period. I use the folders as a way to separate their art on the drying rack. It makes passing out artwork at the beginning of class so much easier! These simple routines have made our classroom run smoothly. 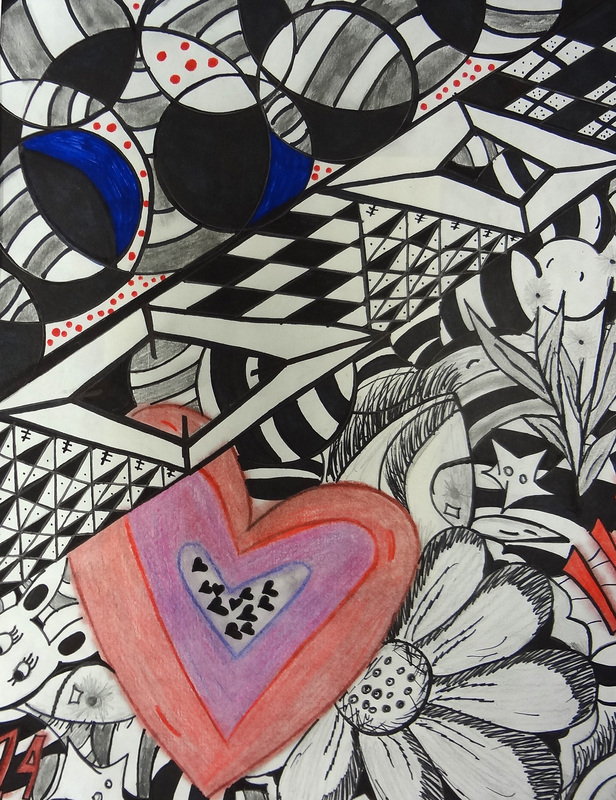 Students always know how to turn in their art and at the beginning of the period they can get right to work. They are so excited when we get to learn about the artist that their table is named after! 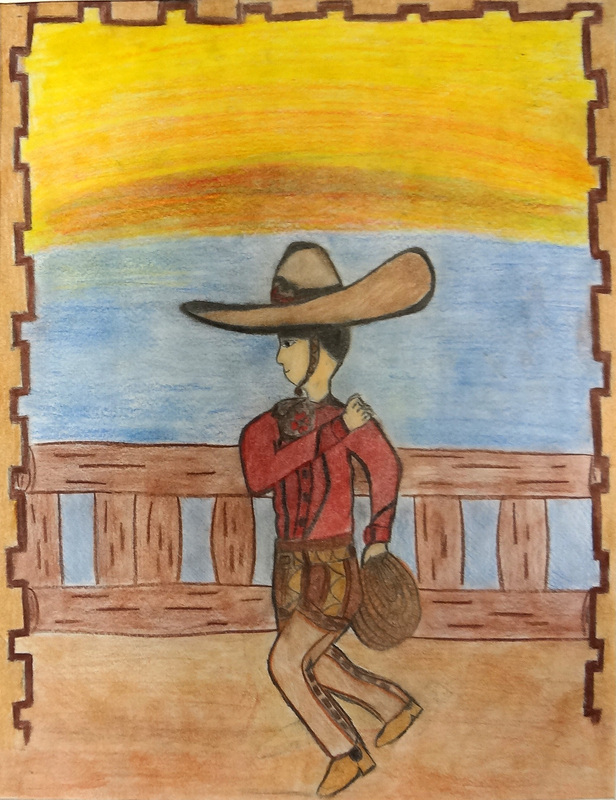 During the second semester, it has been amazing to see how my students have used the different materials and techniques I’ve introduced to them to create Independent Projects. This student began a painting of butterflies using acrylic paint. She was stuck deciding what to do for the background. At the end of class she grabbed a couple pieces of paper, asked for some oil pastels, and said she knew exactly what she was going to do. She came to my room the next morning to show me the finished project! This is a special piece of artwork because it marks the transition of one of my seniors. 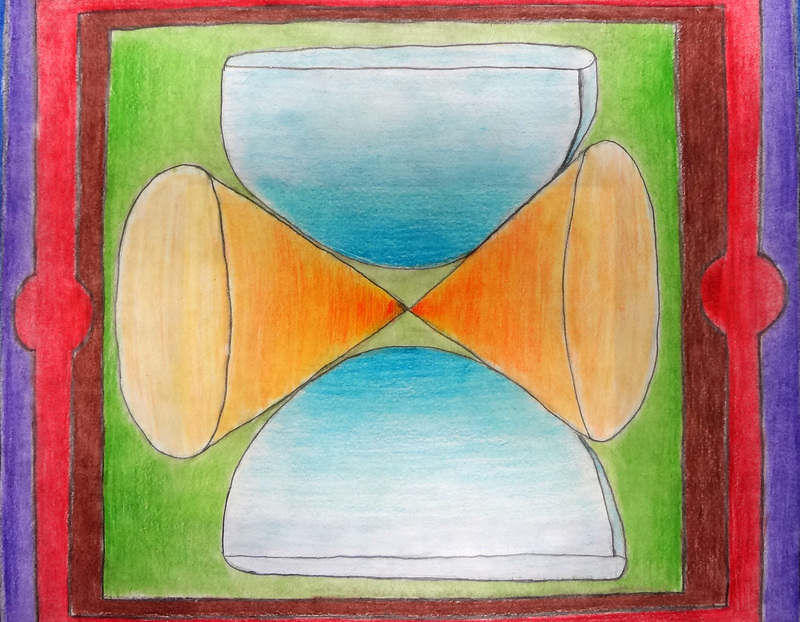 First semester, I had a conversation with him – “I know art isn’t your thing, but you have to pass this class to graduate.” He stopped laying his head down in class and slowly started engaging in the assignments. This Independent Project is the beginning of him really embracing his creative side. We had just finished making paper-cut artwork. He created the painting and decided to use an Xacto knife to carve designs out of it. I love watching my students explore new techniques on their own. A student in my 4th period class told me that he wanted to try transferring photographs to pieces of wood. I showed him how to do it, and the project took off like wildfire. I’ve had 5 students in that class create a wood transfer of their own photograph. 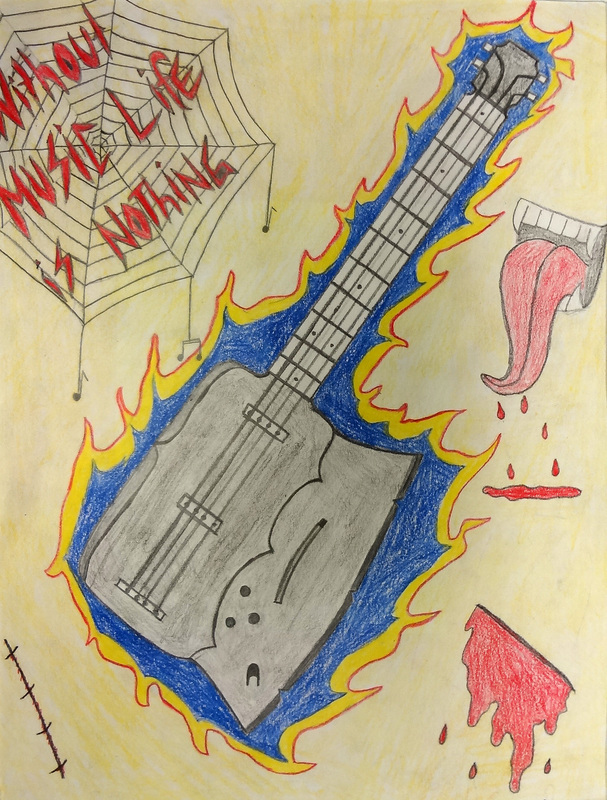 What I love about this project is the way it connects with my students’ everyday lives. This student used a photograph of her quinceanera. The wood transfer process is fairly easy, but does take several days to complete. This video is an excellent guide if you are doing it for the first time. If you ask your local print shop to print the photo out as an “engineer print” it is much cheaper and the paper is thinner, which makes it easier to scrub off. After the students scrubbed off all the paper and let it dry, I had them finish it with several coats of furniture polish. When my student told me he wanted to paint a valve cover to display in his room, I had no idea what process he should use. He did some research on the internet and talked to our Auto-tech teacher to figure out his plan. I loved that this project gave him the opportunity to experience what professional artists do when they have an idea, but aren’t sure of how to proceed. He painstakingly taped sections so they would stay raw metal and then spray painted the rest. When I taught middle school, I had a system where my students could earn time by cleaning up quickly or answering questions. They could use the time they earned for Free Art Friday. When I started teaching high school, I wanted to have a similar system. However, I wanted my students to be more focused and create more polished pieces. I came up with the idea of Independent Projects. When students finish a project early, they begin working on an Independent Project. For these projects, they have the freedom to choose any subject they want. They can also choose to use any of the materials that we have already used in class. Each students has a folder that is filled with notebook paper for our writing assignments. They keep any unfinished Independent Projects in the pockets of their folder. This makes it easy for them to have something extra to work on, without them having to finish that project in just a day or two. Once we finish a class project, I schedule a day that is just for Independent Projects. This gives everyone time to focus on their individual artwork, and it also allows students who were absent to catch up with the class. Independent Projects have helped so much with classroom management. One of the challenges of teaching Art is that there is such a wide range of paces that students work at. Having something meaningful for students to work on if they finish early means that they are still engaged, which keeps them from misbehaving out of boredom. Part of their mid-term exam grade was to take an Independent Project that they had started and finish it or polish it up. (The other part of the grade was to write about if they thought an image was art or not, using the Elements of Art to support their case.) Some students decided to start a new project and finish it in the extra time we had for the exam.